Skipper Stephen Wild believes Salford City Reds can finally begin to fulfil their potential under their new owner. 24 hours before in their opening Super League fixture. "There's a real buzz around Salford," Wild told BBC Radio Manchester. "All I can ask if for the fans to stick by us for the next few weeks and months until we do gel as a team and do get some players to build our squad." He continued: "The future's bright and hopefully we can start fulfilling that potential that everybody's talked about over the years. It's onwards and upwards for us." 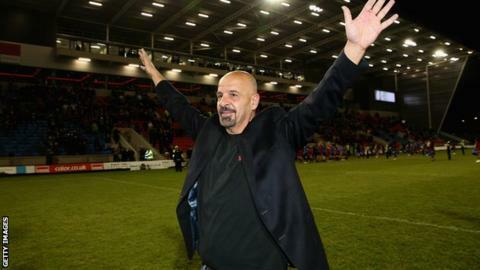 Salford's future was in doubt at numerous points during the off-season because of the club's ongoing financial problems. The versatile Australian, who made his debut for the Reds against the Warriors, is also confident the team will improve as the season progresses. "The playing group is a really good group," he said. "For them to stay positive throughout this whole time is a credit to them. "Now it's a matter of putting it behind us and starting to take control of our own destiny. "You can only play the cards that you're dealt. We've been dealt some pretty ordinary ones, but it's all about turning them into a positive."